March 2nd was a big day. We had two anniversaries to celebrate. First, it was Ian’s and my three-year anniversary (yay! ), and second, it’d been one year since we launched our traveling life and set off for our first destination (Norway). To celebrate, we took a 3-day trip to Volcán Arenal, a volcano that’s dormant now, after an active period that ended just 5 years ago. Aside from visiting the national park and taking in the marvelous views, we went ziplining for the first time (which was AWESOME). 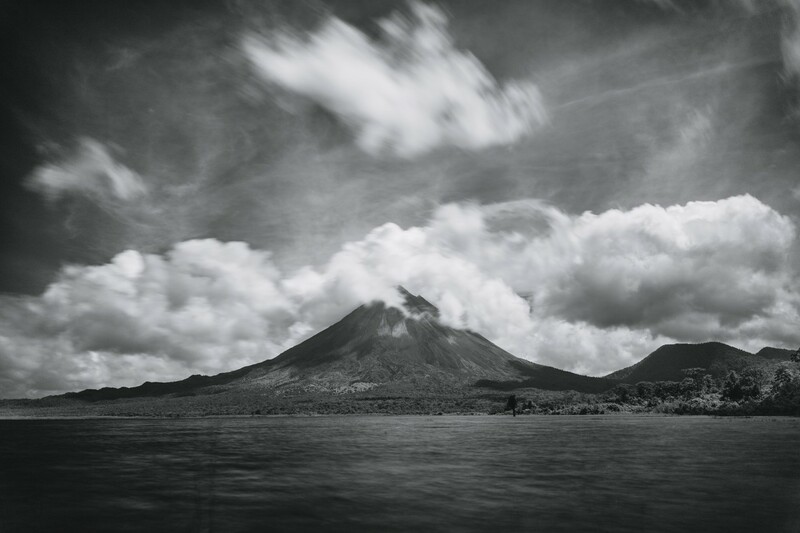 Ian took this photo on the last day of our trip, when we stumbled upon an entry point to Arenal Lake. We spent about 30 minutes along the shore, taking photos of the volcano and what I like to call the “swimming tree” (keep an eye on our Facebook page for a photo of that thing). Still experimenting with infrared photography, this is an image captured using an infrared filter, and post-processed in black and white. This photo was taken with the Sony a7 II and 35mm f/2.8 lens. (Continue to view full photo). Want to see more? View our previous shot of the week posts here. This post was handcrafted for you during our travels in Costa Rica.